Scenic Mountain Home, 3. 5 Acres no Mirror Lake Ranch! Listagem do Novo a partir de 1º de junho! Construído em 2006, esta casa oferece comodidades modernas em um cenário encantador entre as montanhas. A propriedade fica a apenas 6 milhas ao centro de Franklin. É sempre um prazer voltar a esta casa quando os passeios de um dia acabam para apreciar a vista da montanha enquanto você balança na varanda. Como Premier Partner, demonstramos e estamos comprometidos com tempos de resposta rápidos, melhores tarifas e uma ótima experiência para os hóspedes. 2 Banheiros: um em cima e um embaixo. Even though the weather didn't cooperate, we really enjoyed our stay and hope to return later in the spring . Beautiful home, clean. No Mountain View. Try to arrive during day light. Beautiful and clean home. Comfortable beds. Kitchen has every utensil and pots/pans you will need. Mountain View hidden by trees. Did not appreciate the women who interrupted our relaxing morning by showing up unannounced at 9:30 am in to check on the place and than decided it was necessary to check the plants on the second level porch (we were left a note to water the plants during our stay which we did and she still felt the need to come up on the porch and check anyway) She extended her stay by racking leaves in the small enclosed lawn. Thought the $10 charge to have them remove trash was a bit much when you are already paying a cleaning fee. The four of us enjoyed our stay at the cabin. It was very clean, well equipped and just private enough to have a quiet setting while being just a few minutes from town. Patricia was easy to work with when scheduling our stay. We would recommend this location to friends and family. We are hoping to return again. We enjoyed dinner at Lake's End on Lake Nantahala and driving up to Wayah Bald. The views were incredible. We attended a concert at Smoky Mountain Performing Arts Center, which is always a good show and friendly people. This is our fourth trip to Franklin, and we will be coming again. Very comfortable, you don't need to bring a thing has everything you need. We had a wonderful stay here over-all. It’s a beautiful setting and a lovely home with all the amenities, including an amazing deck. It is also pet-friendly. The owner was very responsive for the most part. The one downside was that while the listing says it’s a 10 minute walk to the creek, including a photo suggesting that you may walk alongside it, we had a neighbor harass us and insist we leave the one time we did walk there. I don’t know what’s going on there, as the owner never responded to my message about it. It was quite off putting and if it’s not available for renters to visit, the listing needs to be changed. Thankfully there is a great county park about 7-8 minutes away that we took our dog to for the remainder. This house has everything you will need and is clean! All appliances worked great, all the furniture is quite comfortable including the bed, quiet and private. You do have other homes close by but definitely enough room for privacy. Our dog loved the freedom of the patio leading down to a fenced in yard. 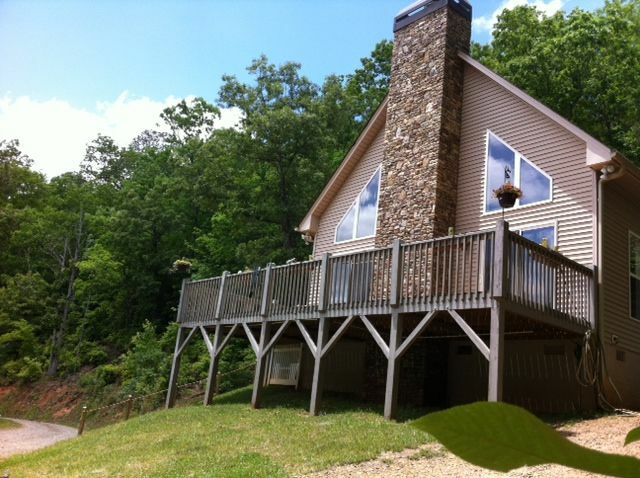 Great location just 10 minutes from town and a little over an hour to Asheville. Hiking right there in Franklin and the Highlands, Sylva area that are close by. Cell phone service worked great as we have Verizon and the Wifi also worked with the occasional reset but definitely would stay here again! Muitos grandes cachoeiras e minas de pedras preciosas próximos!